This is a simple one piece Diabolo from Canada. A small Diabolo made from one piece of wood and painted. The Sticker appears on both sides, and are very similar to Cheerio yo-yo stickers, in layout and overall design. Was Acme a side company of Cheerio? Or was it an upstart company from one of Cheerio's demonstrators? 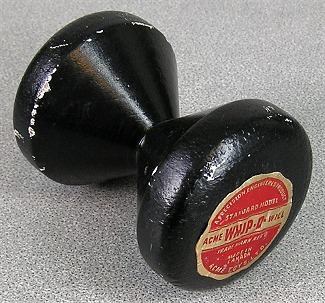 The Diabolo is from the collection of Barney Ryan, Cheerio Demonstrator. If you know more about this company, or this item, please contact curator@yoyomuseum.com.